copic oz: Win The New Copic Ciao Colours!!! Copic markers are THE BEST! I just love the great colour range and the easy blending! 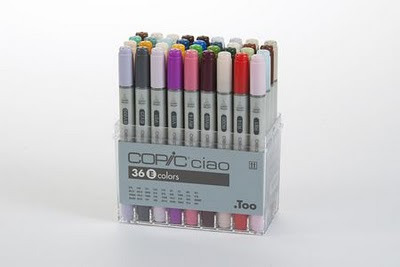 I love copic because they are refillable, great to blend and good colour range. How exciting more colours for me to use. I love how Copics make my cards look so professional and are sooooo easy to use. I'm reasonably new to Copics and still learning techniques, but love the amount of online help you get with these pens. Thank you Copic Oz for the tutorials. Woohoo... more colours!!! I love Copic Markers because there are so many colours to choose, and also because even a novice like me can get pretty awesome results using them!!! I love copic markers becuase of their rich tru colours and they are so versatile! I love all the colours in copics, and colouring with them is such a joy. Adding more colours to my collection is a thrill. I love playing with new colours. I love the range of colours and the ability to add wonderful design elements to my scrapbook layouts. PLUS - being able to just take one set of plain coloured jewellery with me when i go away and colouring them to match each of my outfits from my Copic stash is just awesome! I love Copics because they just colour so well ... and it's always fun to learn a new technique. Thanks for the chance to win! I love copic markers because the way they blend feels like painting, but without the mess!!! I also love them because they're refillable and generally environmentally thoughtful. WOW, I think it would be easier to just say there is no reason why I DON"T like Copic Markers. They are SO MUCH FUN and I think that is the most important thing to remember when I am creating. HAVE FUN. I love Copics - what more can be said? They are beautiful colours, deep inks, so easy to colour with and just so much fun. What not to like? Taninaus said... I love the rich colours I get when I use my copics with my stamped images. I simply couldn't be without my Copics these days, not only do they have a great range of colours, but they give SUCH a PROFESSIONAL finish to my work, that it really gives me confidence. I am a beginner copic marker girl. Always i said i dont have them i colour with derwent, but in november my sister came to me and she has a lot of copics, and we colourd together, and now i am addicted to copic, wow, so beautiful colours. I think i wanna have them all. hihi. I have never used copics,but the are next on must have list. To be honest..I have never used copic markers but would love a chance to win some so I can try my hand at some digi stamps..was going to buy some at Michaels but they are way too expensive. Thanks for the chance to win some. Just became a new follower..Would love it is you decided to follow my blog. also, I put your blinkie on the sidebar of my blog. I love copics because they give a beautiful finish and are so versatile. I am just transitioning to Copics but I love them because there is a colour for everything! Skin and natural colours are hard to find in other markers and there are plenty in Copic! I like you! I like you a lot!!! I'm so addicted to Copics, I've even coloured in paint splats on my clothes with them ROFL. Your blinkie is blinking away on my blog as I type and I've been a FB fan for a little while now too! My coloured pencils are gathering dust these last couple of years as I expand my copic collection, oh dear ROFL. How fun!! Good luck everyone! As you might know I love EVERY THING about Copics!!! So versatile! Beautiful blended colours,so many different uses. Colouring is such fun with a little patience and some Copic Markers! That's why I love mine. So glad we get the new colours in Aus too! Copics have opened up a whole new world to me .. once I only scrapbooked, now not only am I making cards and stamping (not something I did before) but my friends love my cards as part of their gifts, and I am also now part of a card making design team! I have only been introduced to COPIC's in the last couple of months, I've been busy searching gorgeous blog's for helpful hints and techniques!! Looking forward to your blog, I have a total of 8 in my new addiction/collection and love them all :O) Thanks Tricia. I just love copic markers and am having a great time colouring in... gotta love them! What's not to love about them!! Over 300 colours to choose, all so pretty!! Love, love, love Copic markers...so, so much! I love them because of their versatility, the brightness and the depth of experience they provide in my crafting activities. Thanks for a wonderful blogsite!! Copic markers are easy to use, blend, and there are so many great colors. They give you all the tools you need to make your projects look great. i love copics cause i can blend them with ease, a fantastic range of colours and most of all they are mine!!! and everyone in our house knows do NOT touch mums(my) black marker baGS!!!!! (i use the 72 copic storage bags)LOL!! i am looking forward in buying the new set....if i dont win! I LOVE COPIC MARKERS!!!!! I can doodle & draw on anything & everything - there's nothing I cannot colour with these! I love the different textures you can create when you do a couple coats to differnt surfaces! Would be stoked if I won this pack!! Sooo many colours - I need more storage space!! LOL!!! Love My Copic's and now I might have to get another wallet to house the rest. Good Luck everyone. I really love them and am saving hard to be able to get more. As a kid, I colored almost every minute I could, blending and colors and outlining. As an adult well...copics have it by a long shot. I just found these little gems a few months ago buying a few at a time. I still have limited colors, but I try to make them work. As far as I'm concerned they are the best product on the market, and I love them. I can't seem to put them down, but I would LOVE to have more colors for sure! So I'm keeping fingers crossed on one hand, and waiting to see if I win :o) THANK YOU for giving all of us this chance to win. This would be my lucky lottery! I love copics as it is so easy to blend your image, with different light and dark shadows, they are refillable, last for ages, and they arent just pens they are an investment into creativity. I have been waiting all my stamping life for Copics and now couldn't live without them!!! What a fantastic giveaway, have become a follower to your blog, liked you on facebook and placed the blinkie on my blog. I love Copics, for the range of colours on offer, the quality of colour and ink and that they are refillable. I love the range of colours and the depth you can obtain in an image by blending. It's taken stamping to a whole new level that wasn't possible with water based markers and I love it! What's not to love about Copic markers!!! My whole world has changed...I am addicted to colouring & it doesn't matter how good you are as the pens do all the work...love them!!! I love copics because they are just the best for blending and colouring and can make any person feel like an artist, regardless of talent! Love copics! They are so easy to use and you get a great result every time! PS No Facebook account...hope this doesn't exclude me! I just love the effects you can get with these pens, they are easy to use and refillable. What more could you ask for! I have ticked all the boxes (with my imaginary copic marker) "liked on FB" "Followed the blog"
I love all the copics and often use a combination of ciao, original & sketch. To personally own a whole set would be wonderful and would increase my creativity... my fingers & toes are crossed. I like Copics for all I can do with them. The huge variety of shades per color are what impress me the most, they're my newest color technique for my artwork . .. slowly becoming my favorite :) thank you! Perfect for my fashion illustration! Firstly it says 'ciao' on the packaging. SERIOUSLY it's just screaming, "Hello Pussikat!". Other lucky people have Copics and I am sooo jealous. With these babies I'd improve my creations 10-fold. I'm a starter with Copics but love the way you can blend with them... they are so clean and crisp to colour with. Would be over the moon to win. Oh boy!! I love copic markers because I can't paint to save myself and I CAN colour with my lovely copic ciao, I love, love, love my ciao's. Very slowly building up my set so would love to win those lovely new colours. Copic markers are wonderful. I've recently decided that I need to increase my collection vastly. It's just such a pity for a starving artist such as myself they are so expensive! (Well worth the price though). I've even whipped up a little web application to allow me to keep track of the colour collection, what I own, and what I want to buy next. It's all very exciting! To win a set of new markers? That would be super awesome. Just not sure how to add the copic oz blinky .. any hints ??? Hi thank you so much for the chance to win. I love the copics because I still don't have them. I just tried them out at a friend and it was a new experience of coloring. I love copics because there the best, they blend well, you can erase them to a degree and get many different effects for all sorts of styles. they come in a large variety of colors from extremely light shades you would not find in another pen to exotic and dark versions of each color. the colors are coded making them easy to remember what you have used and own and they also have a variety of high quality nibs to chose from. There the most diverse and can be used in many professions like fashion, architecture, art and more. and come with all sorts of accessories. I can even think of anything bad to say about them : D.
3) I covet at this time the tools with which to airbrush! I love everything about Copics from the effects I can create, the freedom they afford my creativity, the reaction of students in my classes when they 'get' blending and the joy in my childrens eyes when they finish a picture they didn't think they could. I love the vast variety of colors. I also love the fact that they won't bleed and will blend in with other colors, The plus fact is it won't affect the tip of the marker (nib) when you blend different colors. Love them. Im new to copic and scrapbooking, but they make such a great addition. The colours are wonderful and they are so easy to use. And being refillable.. makes them even better.. I'll definitly be getting more of these.. I have just discovered these pens and am really excited about all the great things I will be able to do with them. They are by far the best and most versatile pens that I have come across and I have tried a few! It's just a case of where to start! I love my copics. They have changed the way I colour making me more aware of the light source so that I can get the richness of depth in shadows etc. The versitility of the blending makes them way ahead of anything else on the market. I have only just discovered your site and I love it already. I absolutely LOVE my Copic markers and since getting them have not used any other method for coloring. The depth you can achieve in your coloring is amazing. I have become a follower and added into facebook. Looking forward to checking out all the older posts. I am still trying to learn how to use my copics but I just love how they colour. They just give your cards such a professional look. Thanks for a chance to win some of the new colours.. I only have a few so they will be much loved!! I am now a follower and have joined on facebook!! I am still only learning with the COPIC markers but I LOVE THEM! We will soon be opening a store and are making lots of our own stamps, I know I will promoting using the COPIC markers to all our followers and customers. I have your blinky on my blog, I am following you on facebook - I am in LOVE!!! I love stamping and coloring with my Copics and the new set will give me many new color combos to play with. Thanks for the chance to win! I don't have a blog, but wanted to leave a comment as I just looove copics, fantastic selection of colours, so easy to use, and just love that you are able to refill them!!! I LOVE Copics. They blend so well, are refillable and have a fabulous range of colours. Good luck everyone. I am already a follower of your blog & facebook. Copics are just awsome and I love the results, they are also a bit addictive and love to collect all the gorgeous colours!!!! Love my Copics and love sharing my skill with others. So just can't wait to get the new colours! These are such a great buy, with so many different shades of one colour even beginners can use them. You can never go back to scrapbooking without a set of these markers!! when I have only one? and show you some tricks! I love the professional look Copics give to colouring and the scope for blending and shading. I'm also having fun experimenting with Copics for decorative lettering. Inside the winter season, Invest in Womens Moncler Coats each individual may want to have just one men's moncler layers despite the best way profitable as well as poor these are. Though it's fairly high-priced for the people people today, it truly is valueable to help you invest in true is usually interior it is really comfortable availability features differ further outfits. On the bright side, Mens Moncler Branson Blue Jacket oncler Wiki usually are getting promo presently.